Keepin' it brief this weekend. Oldest kid is on a school trip. Youngest kid is sick. The weather has been really warm so last weekend's snow is now mud... and bad dog loves mud. So I've got a killer stack of ARCs to devour, carpet to shampoo, and we had to cancel our movie date plans for tomorrow thanks to the kid being sick. 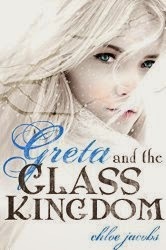 I'm trying to finish up GRETA AND THE GLASS KINGDOM, hopefully tonight. I'm having a tough time getting into it and I can't figure out why. Maybe it's just been too long since the first Greta book came out? After that I have to choose between 4 ARCS that all release on the 23rd! Yeah, I'm in over my head. lol But I read every Covet release and I really wanted to read ONE PERCENTER and figured I might be able to slip in the other new adult title on the fly. I'm overly ambitious as usual.